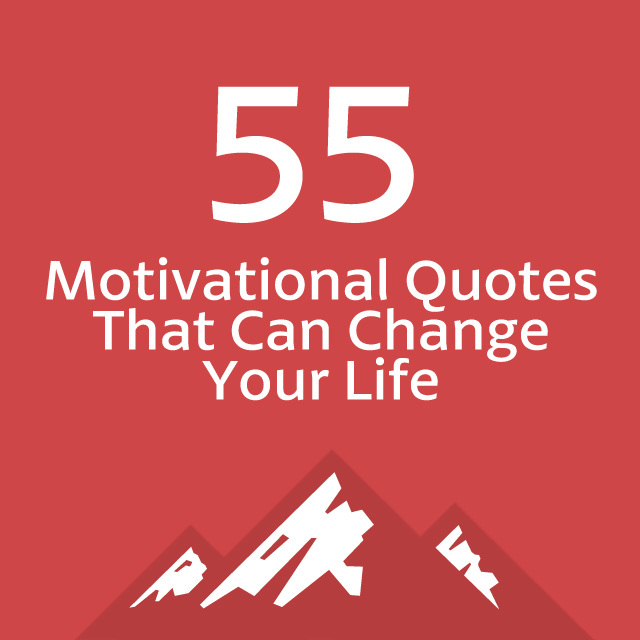 Here are some of the best motivational quotes to get you up and get you moving. They’ll help you realize that nothing worth having is easy, but that you can enjoy the work involved in getting the prizes that you covet the most. Refer to these daily so that you get your mind in the right place to be the most effective version of yourself possible. This is true about the bigger tasks in life, and it can lead to a feeling of not even wanting to try. When it seems impossible it can be really easy to get into a defeatist mentality and that just adds to the impossibility of it all. The best course of action is to reach back into your past and find a situation that seemed impossible at first which eventually was accomplished and led to success. We all have them, and tapping into that power of belief in order to apply it to your current impossible seeming situation is key to starting on it with the right mind set. 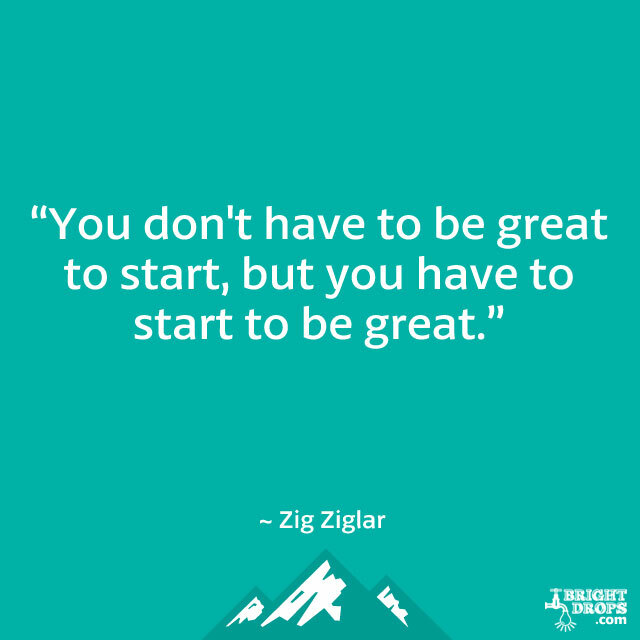 Starting is the most important part of success, even though finishing is often thought of as having arrived. It’s so easy to get caught up in wondering about how things will turn out that we lose sight of getting started. Also, if you worry about failing, or coming up against obstacles along the way, this can deter you from even starting. But all of that is imaginary thinking because you only know what will really happen when you start moving towards your goal and deal with these challenges as you come upon them. This is true because if you’re afraid to fail you won’t make any progress and there is only progress or regress, there’s no standing still. You’re either moving forward or you’re moving backward. 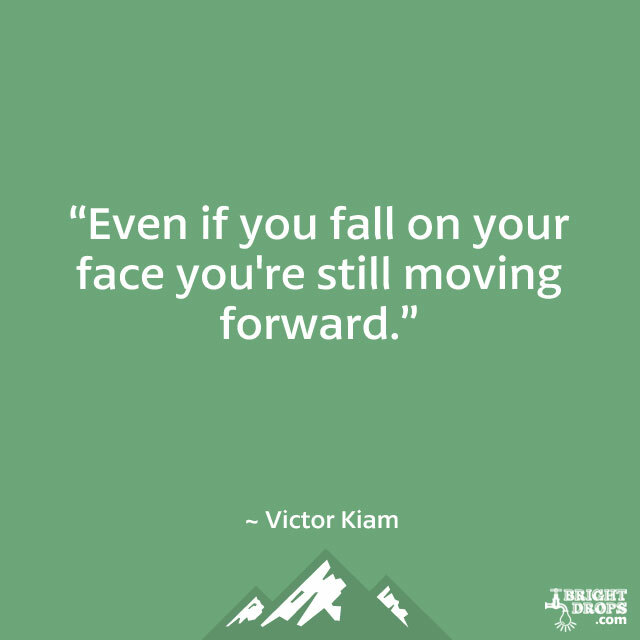 You always want to keep forward momentum, even if that involves falling on your face. You’ll learn from the experience and be able to apply that to future challenges, potentially avoiding future face-fallings. When you don’t attempt something for fear of falling on your face, you don’t move forward, and you end up shriveling into a version of yourself that is not as great as it could be. Rather than talk the talk it’s better to walk the walk. Much of what is spoken is just hot air, and if you find yourself talking about what you’re going to do rather than talking about what you’re doing you may be in a state of not getting things done. It’s better to get the work done that needs to get done and be able to talk about that rather than just spout off about all of the things you plan on doing. 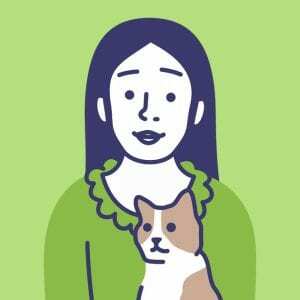 What are some things you’ve been talking about lately that don’t seem to have any traction, or any sign of getting done? Focus on those areas for a week and put some inspired action behind them instead of just talk. Quitting is the easy way out, but it doesn’t produce anything of value, and ends up leading to a habit of quitting that can haunt you for a lifetime. The good news is that you don’t have to accept quitting, and you can pick up old projects that you quit on too early and see them through to fruition. Of course it is also possible to strategically quit on something as long as you feel that there is a more worthwhile project to work on that demands all of your time and you don’t want to split your focus. If you’re waiting around for conditions to be perfect before you stick your neck out you’ll be waiting forever. This quote reminds us that you have to have some faith in order to branch into something new and unknown. 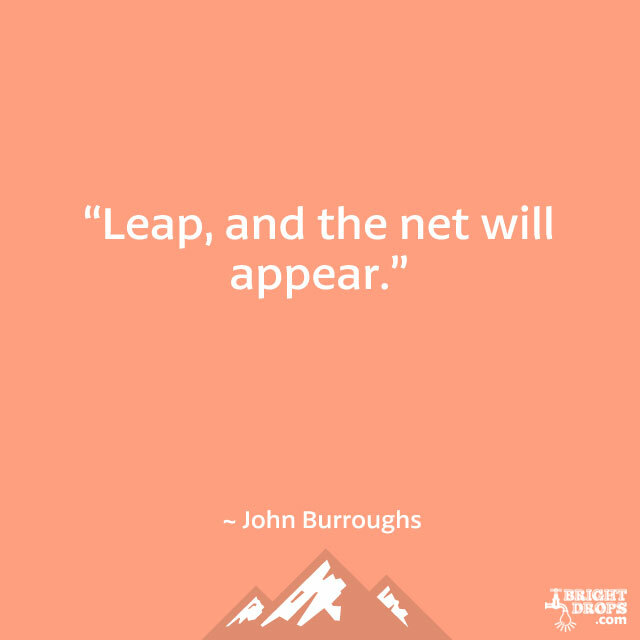 Take the flying leap and trust that if you don’t make it that things will be OK and you’ll land safely. What usually ends up happening is that situations will present themselves that never could have or would have presented themselves had you not made a bold choice and thrown yourself into it. There’s no guarantee that your long-term plan will succeed because you never know what will happen in the future. None of us do. The only time you have complete control of is right now, so that’s the best time to do all of the things you’ve been wanting to do but have been putting off until some vague future date. 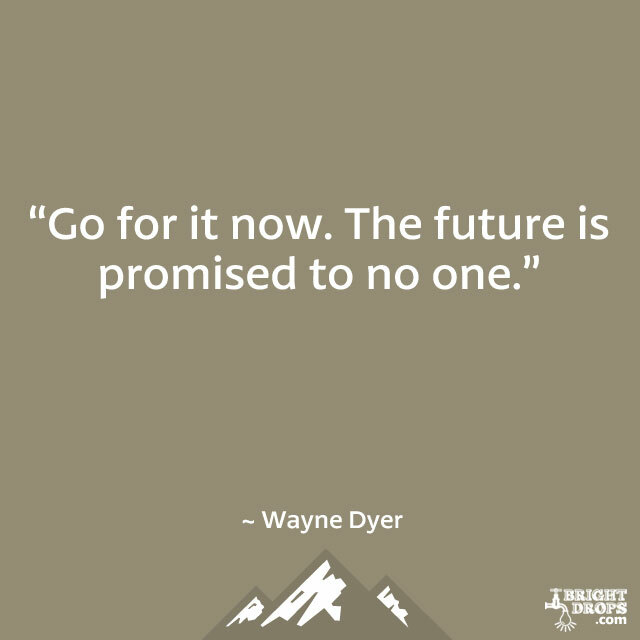 If it’s worth doing, it’s worth doing now, so don’t wait. Put some things into motion and see where it leads. You may be surprised to find that this brings your goals and dreams faster than you ever thought possible. How can you know what your limits are if you’ve never pushed them? This quote is good not only for encouraging you to find your own limitations, if you have any, but also for testing the limits of what is possible out in the world. Sitting by and thinking you have limits without actually finding out if you do or not is akin to the story of how an elephant won’t try to break the simple rope that ties him down because as a baby they chained him up with a heavy chain. How many limits do you put on yourself that aren’t even real? It’s easy to get into the mentality that you have to wait for the perfect opportunity to present itself before you’ll start to work hard. But the trick is to work hard so that the perfect opportunity can present itself. It’s amazing what opens up when you start giving it your all every day. You’ll find that people, situations, and events will happen in your life that are the result of the work you’ve done, and you’ll realize that unless you did the work they would not have appeared at just the right time for you. Here’s the best way to sum up the act of procrastination. 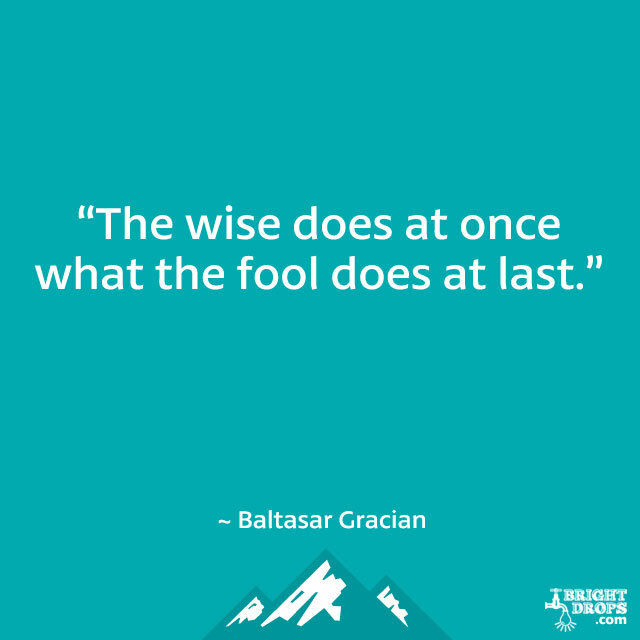 Be wise and just do what needs to be done at the time it needs to be done. It is rather foolish to push things back that must be done if they’re eventually going to need to get done at some point. When you do the work in a timely manner you free yourself up to do more and achieve more, rather than struggle with easy tasks that should have been done long ago. When you put off what needs to be done you are putting off your success and plenty of opportunities to accomplish and become even more. Ever get caught watching the clock and stressing out about the ticking seconds and thinking that you won’t be able to get your current task done in time? That’s a dangerous thing to do because the clock doesn’t stop unless the batteries go out on it. 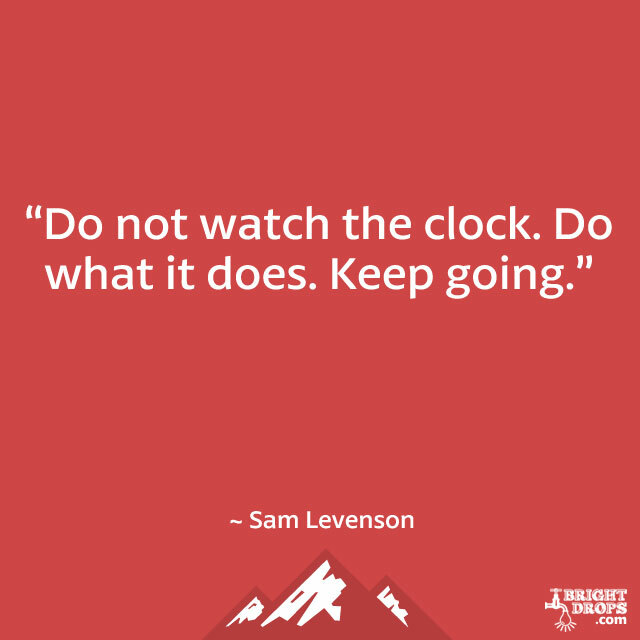 You should take the same approach and work with the clock rather than against it. It keeps ticking methodically and so should you. Make use of each second and don’t waste time because you’ll find that eventually you’ll be looking at the clock and stressing over it, which doesn’t produce anything. A funny thing about taking steps towards your goal is that eventually you get there. The trick is to keep taking those smaller steps while keeping a positive attitude about the progress you’re making. It’s harder to do than it sounds because often these steps are not glamorous and it feels like you’re not getting anywhere. It’s easy to lose sight of the bigger picture and where you’re going. 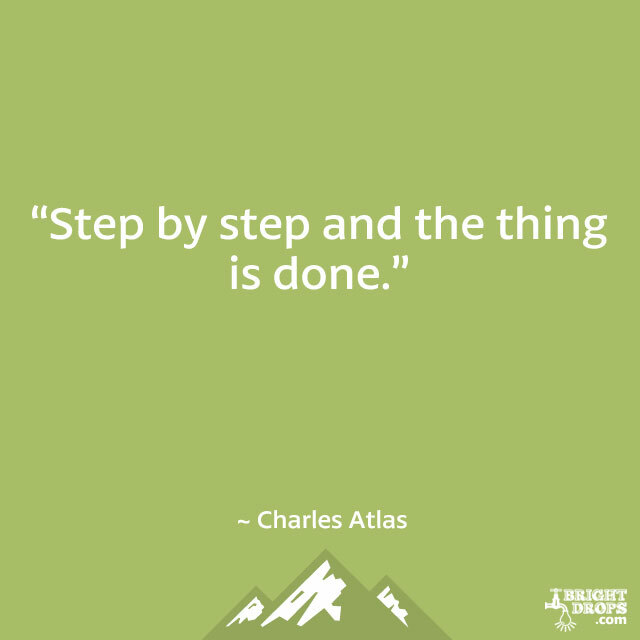 But as long as you keep taking the steps you’ll achieve something bigger than the sum of those steps. Leave it to MJ to put into words a simple truth. You can’t succeed without failing because failing shows effort and shows that you’re attempting success. Failure also teaches, as surely Michael missed plenty of shots but tweaked his shot with each miss until he missed less and less. He also wasn’t afraid to take the shot, even if the entire game was riding on it. That fearlessness in the face of possible failure is something we can all take away. If you get started enough times you’ll eventually get ahead. But those that dream of getting ahead and never start never get ahead. It’s a peculiar secret, as it seems so obvious, but is the downfall for many who want to be successful but don’t actually start anything that could get them there. It doesn’t matter if what you start is a giant success or not, as long as you keep starting things you’ll eventually get a hit. And if you don’t at least you won’t have any regrets because you put your whole self into trying. The thought of always doing your best may sound obvious, but honestly how often do you find yourself slipping into less than your best? What we do in the moment, with each day, is what we’ll end up reaping later. 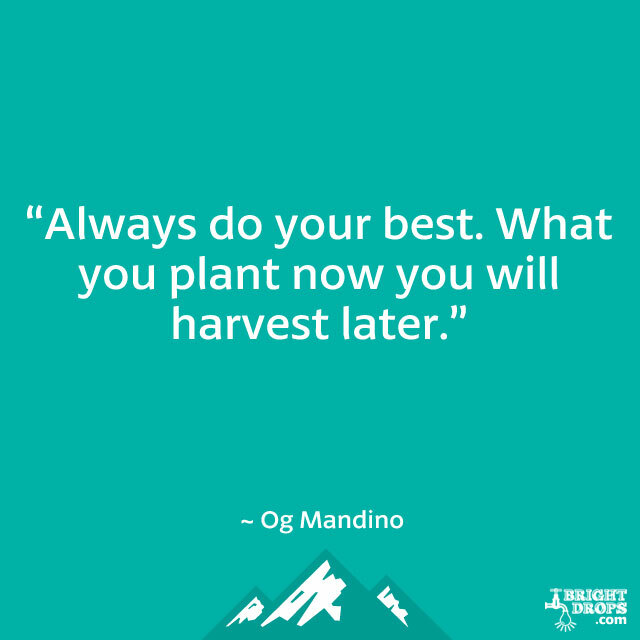 It’s best to get into the habit of giving it your all each day because it just sets you up for a better and better harvest later. It’s a hard concept to grasp because each day presents new difficulties and a requirement for us to refresh ourselves and recharge our energy so we can do our best and give our all to everything. This is partly true because you also have to believe you can do it. Be sure you don’t get caught in the trap of chasing a dream you don’t believe in. Disney talked about dreams a lot but he also spoke on putting belief behind them. Once you have a dream that gets you excited and you amp up your belief that you can achieve it, it’s only a matter of time before that dream becomes a reality. 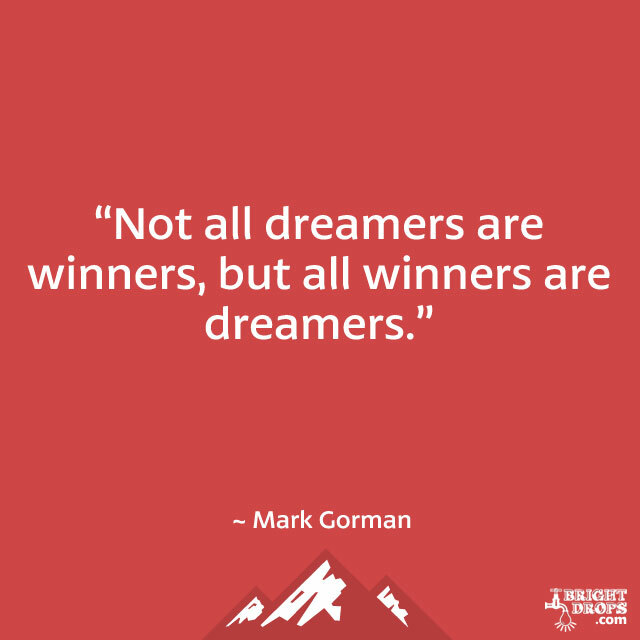 The point of this quote is that you wouldn’t have developed the dream if you weren’t capable of its achievement, which should help you believe you can do it. It’s easy for the day to get away from you if you let it, which is why it’s important to take control of the day and bend it to your will. There will always be distractions and things getting in the way of what you have planned for the day, so you have to make sure that what you want to get done takes priority. Get into the habit of letting the day run you and you will stack many days up that don’t go your way. Have a clear plan for what you want to accomplish for the day and make sure that you stick to that plan. Sometimes what we’re working on doesn’t seem like it matters much, especially when we’re doing things for other people when we’d much rather prefer to be doing things for ourselves. But if you put the sort of effort into everything you do as if it all matters, you’ll find that it does make a difference to your life and your mental state in the form of a better feeling. 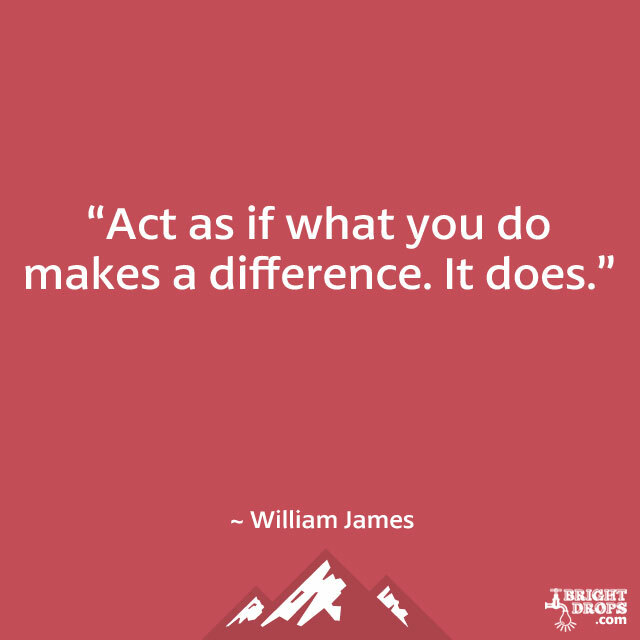 We all want to feel like we’re making a difference, and this quote is a reminder that we are making a difference, it just might not be as big as we’d like, but over time it can get bigger. Nothing from nothing leaves nothing, so it’s a better idea to try your hand at greatness. So what if you fail, and least you tried something amazing and have a story to tell. Those that attempt nothing wind up with nothing to show for it and no story of even an attempt. How boring! Make sure that you’re always striving for something great so that you can look back and say you gave it a go. And if you have the right amount of perseverance and a bit of luck you might actually achieve something great for the history books. It doesn’t matter if others believe you can succeed, or that you will succeed. No one can give you the resolution to succeed except yourself. It’s important to stoke those fires regularly, even daily so that you don’t get into the mentality that you can’t succeed or that failure is an option. Remember that we measure success personally, so that your idea of what it means to succeed is different than other people’s. Follow your own path to your own vision of success and stay the course. Be the person today that your future self will thank you for being. You’re setting yourself up for your tomorrows today, and if you think about it you’re living the life today that you’ve set up with all of your yesterdays. If you’re not where you want to be today, you’ll likely have to change what you’ve been doing in the past that led you to this moment. 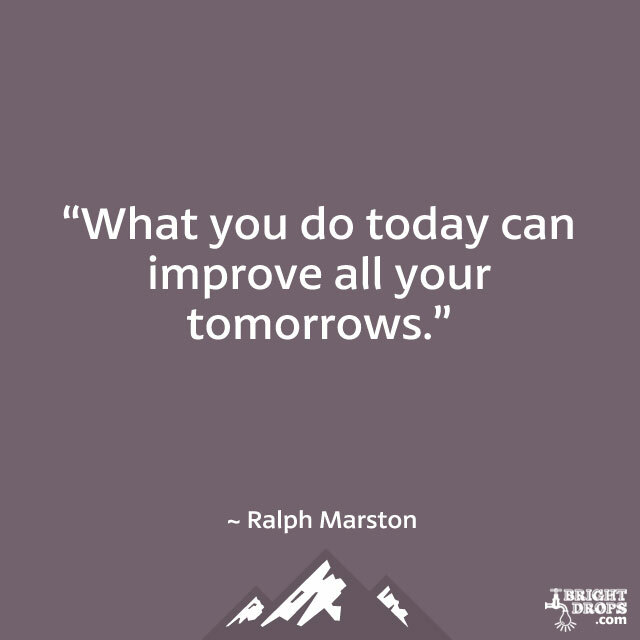 Begin to make changes starting today that can influence how you’ll be living your life tomorrow, and the day after that. When you hear stories of success do you ever think that there isn’t any left for you? It’s a common thought to have but it’s not accurate. One person’s success does not leave less for the rest of us. The universe expands, and the fact is there’s always room at the top because there’s always people getting there. It isn’t a zero sum game with a loser for every winner. 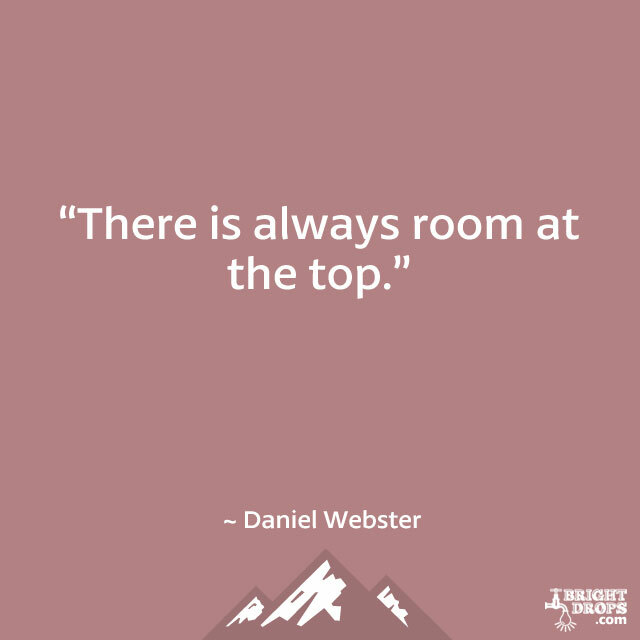 There are plenty of winners coexisting at the top and you can be part of the party. So use other people’s success stories as motivation rather than discouragement. This is true because your reputation is built on your actions, not what’s in your head as far as your plans. Plans that stay in your head and never see the light of day will never get you to where you want to be, or to a place where you can have a reputation for being a success. 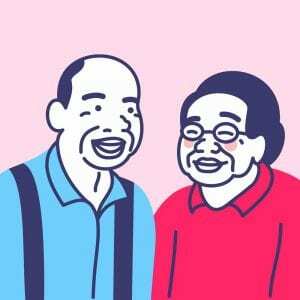 Look at the most successful people in the world and how they got their recognition. It’s because of the things they achieved and did, not for what they said they are going to do. This may be the hardest part of success because it’s difficult to remain enthusiastic when everything around you is crashing down. 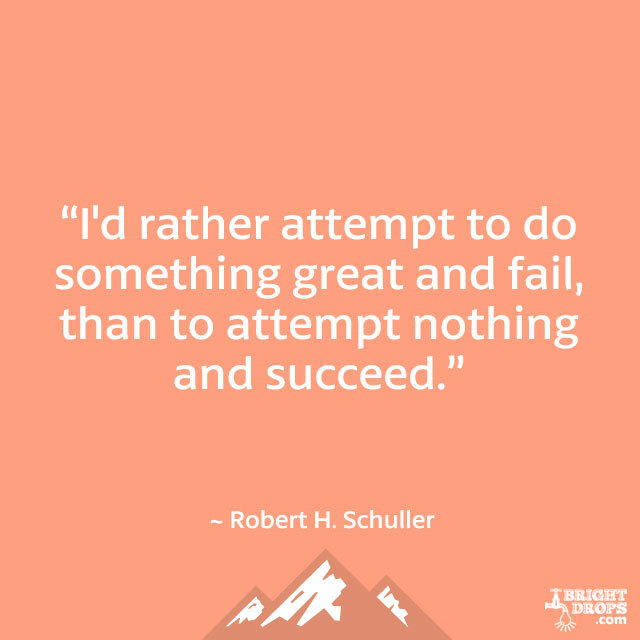 If you have a string of failures what do you think your likelihood is to be enthusiastic about the new things you’re starting? Not very high. But if you can somehow remain enthusiastic, even if it seems silly or illogical to be enthusiastic, you’ll eventually reach success because it’s that positive eager attitude that will make it so you win one time. 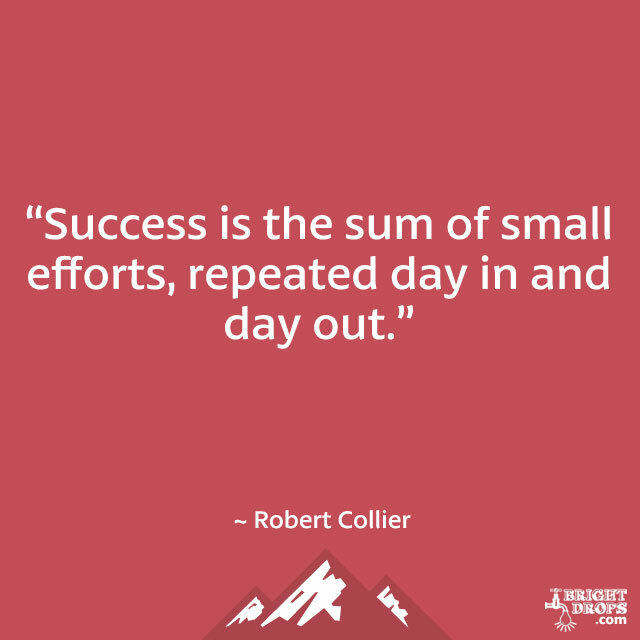 Rather than think that you have to accomplish some huge task in order to be great, it’s better to get a string of smaller things done. If all you think about is doing a mammoth deed in order to show how awesome you are, but all you do is think about it, there isn’t much value in the thought. 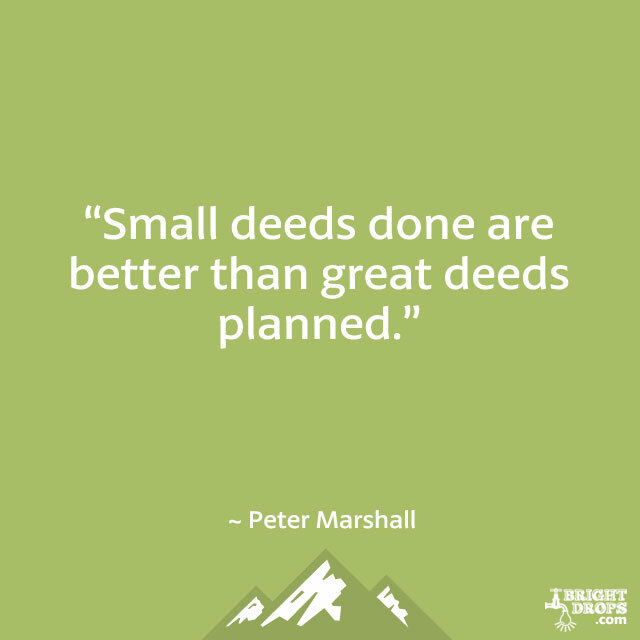 But when you do a bunch of smaller deeds, and get them all done because they’re smaller and you can start on them right away and finish them up without a lot of trouble, you’re actually accomplishing something pretty big even though it might not feel like it. Waiting around for inspiration to strike is going to be a long wait. 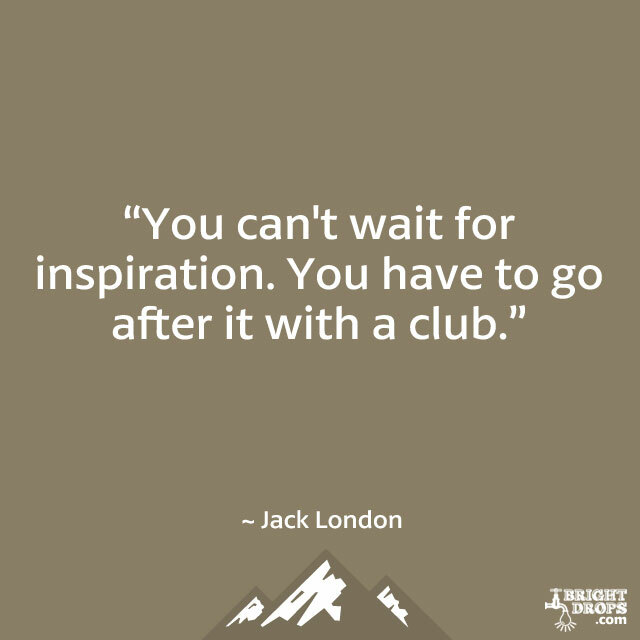 This quote is a reminder that you have to chase down inspiration, and that may come in the form of work. Sometimes you have to start working to get inspired, rather than waiting for inspiration before you start working. The kicker: you can’t just do it one day and expect to be inspired every day that follows. You have to go and get your inspiration each day, or else you run the risk of having a flat, uninspired day, and too many of those in a row leads you places you don’t want to be. A lot of unsuccessful people will point to their lack of opportunities and say that they just didn’t get their fair share. They’ll look at successful people and say that they got an unfair amount of opportunities presented to them. But the truth of the matter is that you create your own opportunities, and successful people have found out this truth and are applying it in their lives. 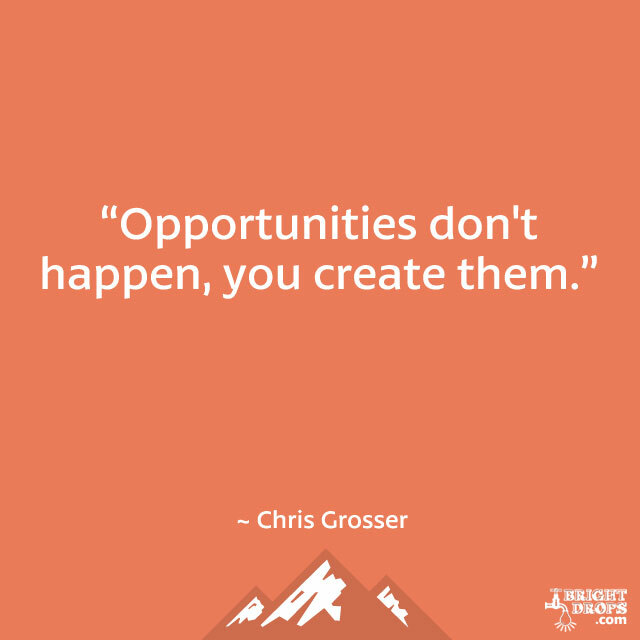 Look at opportunities that have presented themselves to you and realize that you created that opportunity and then took it. It’s not a good idea to expect someone else to come by and change your life for you. There is a bigger chance of winning the lottery, and that’s basically what you’re hoping for when you put the keys of change in someone else’s hand. Only you can do it, and if you want to make a change in your life and be more than you’ve been, you have to be the one that provides the energy, that takes the steps, and that draws a line in the sand and says you’re not going to go back to those old ways again. Have you identified some things in your life that may be the wrong thing to chase? It’s funny how as time goes by some of the things you found important at some time in the past don’t seem that important anymore. You could still be chasing them on autopilot. Once you give up the chase, the right things, the things you want in your life right now, have a chance to catch up to you and you can have what you really want. Give it a try and see if it happens for you, at the very least you won’t be wasting time on the wrong things anymore. 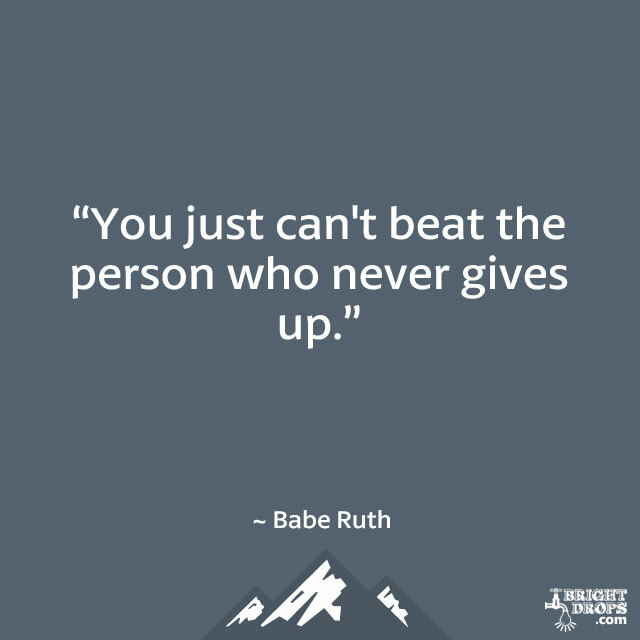 If you’re the type of person that never gives up, you’re going to be really hard to beat. This goes for competition as well as the universe in general. Sticking with things until you get what you want it the mark of a winner not just because it shows an indomitable spirit, but because it represents a powerful intention. If your intention is to stick it out until you win then you’ve got the right thought process that is in line with the laws of the universe. You’ll eventually get what you want as long as you don’t put a timeframe on getting it. It’s easy to look at someone’s success and think that it happened overnight, but most of the time what you’re witnessing is just the last part of their journey. You’re missing all of the work that went into where they got, because no one like to report on that part of the process. Choose just one role model of success and you can be sure that their formula is just to repeat the same small things each day, day after day, until eventually that adds up to a win whether in business, sports, or their personal life. The more you accomplish the more you build up your confidence and find that there’s even more you can accomplish. 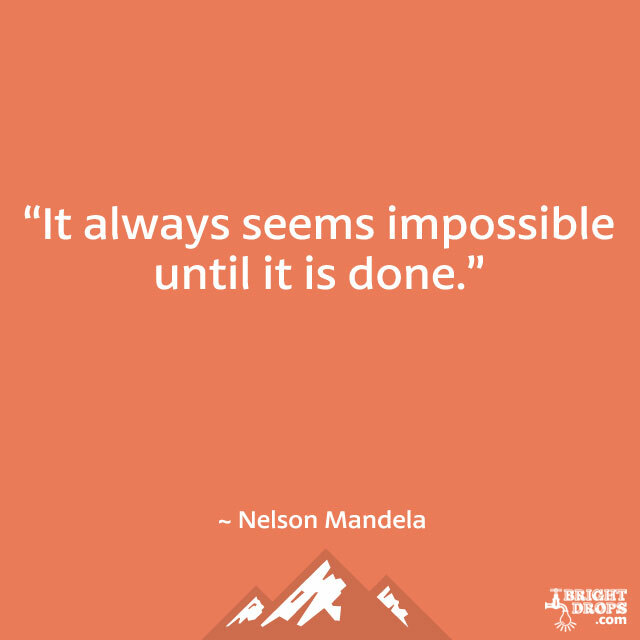 Isn’t it great that just by taking action and getting things done you make it possible to do even more. 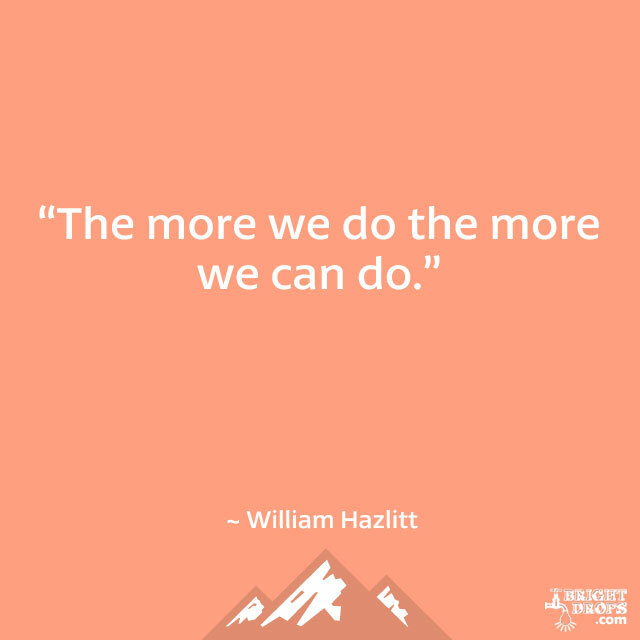 This doesn’t mean you are going to be working harder and harder as you go along, but you’ll become more effective and efficient the more you do, so that you get more done with less effort, and are then able to produce more with the same amount of effort. Your own financial resources will likely grow with the more you do, so you can really do more. The letter s definitely comes before the letter w in the dictionary, but in the real world there’s no success without work. Unfortunately in our society the get rich quick mentality reigns supreme. It seems that no one wants to work for the things in life that have been dubbed most important, they’d rather just have them handed to them in the form of lottery winnings or some other winfall. 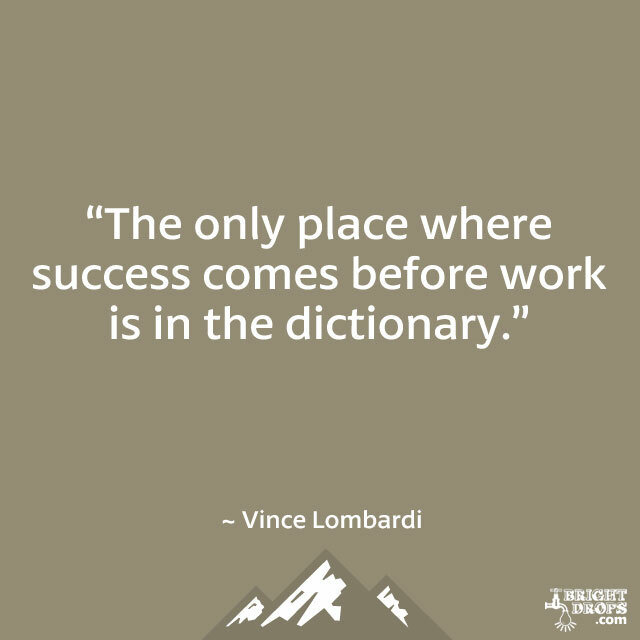 But success doesn’t work that way, and there’s not a shortcut or an elevator that goes to the top. Go the long way, take the stairs, and you’ll make it eventually. It takes some motivation to get past inertia. Once you get going again it’s up to you to form a habit out of what you want to do each day so that you can effortlessly plug away at the things that are most important to you. 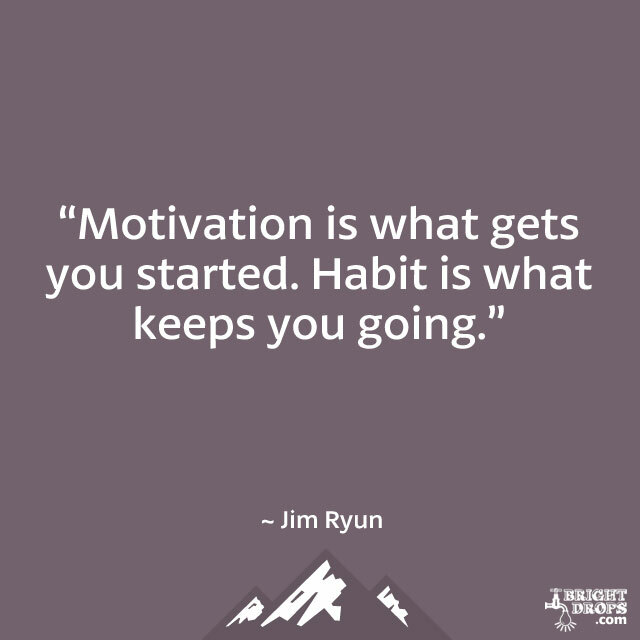 Habits can be good or bad, but either way they play a huge role in success and failure, so make sure you’re establishing good habits or you could find yourself swimming upstream for no reason. It may be safer to never take a shot, but the result is that you don’t make the shot, so it’s the same as missing the shot. Rather than not take the shot and still get the same result, take the shot. The worst that can happen is that you’ll be right where you would have been had you not taken the shot. Often we feel that it will be worse if we try and miss than if we don’t try at all. But that just isn’t so, and it’s important to take the shots that come by in life so that you can say you’ve played the game rather than just observed. It’s interesting to think that if you dare to stick yourself out there, that fortune will side with you. Providence has been said to move with you when you commit yourself to a task, so when you combine these two you have some powerful forces behind you. So it appears that if you dare to take on a challenge or a new endeavor, and then commit yourself to its achievement, that fortune and providence will be on your side and you’ll see amazing things happen that you never thought possible. How much are you willing to admit that what you’ve become up until now, and what you will be in the future are because of your decisions. You are deciding who you are with each passing minute, and you can become what you want as long as you decide to do so. Decide is based on the word for cut, and when you decide you are cutting off the other options you have available to you. This means you are accepting nothing less than what you have decided on. Getting yourself to believe you can achieve what it is you’re striving for is half of the battle. This is not as easy as just saying you believe, but instead involves really feeling it. You have to feel it in your gut that you have what it takes and that you can get there, or else everything you do is going to be laden with a weak energy, and you’re going to have trouble summoning up the power and wherewithal to do what you need to do to get where you want to be. 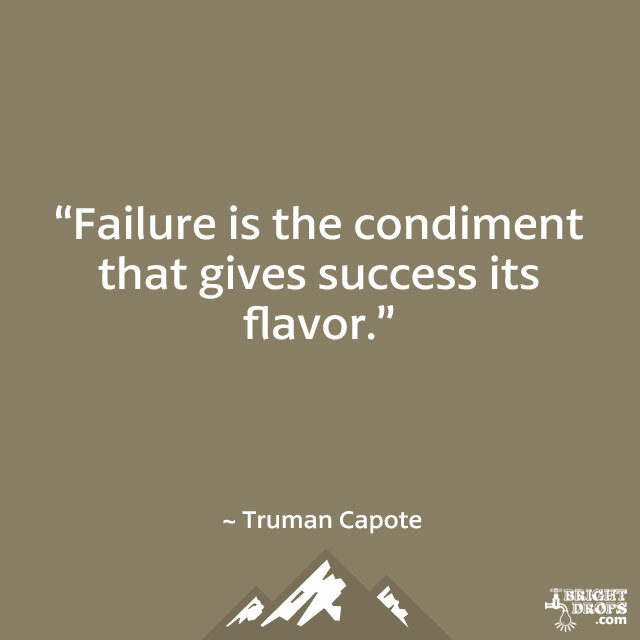 Instead of viewing a failure as a dead end, why not take it a little more lightheartedly with this quote and realize that the goal is not avoiding failure, but instead using it to make your eventual success that much more delicious. 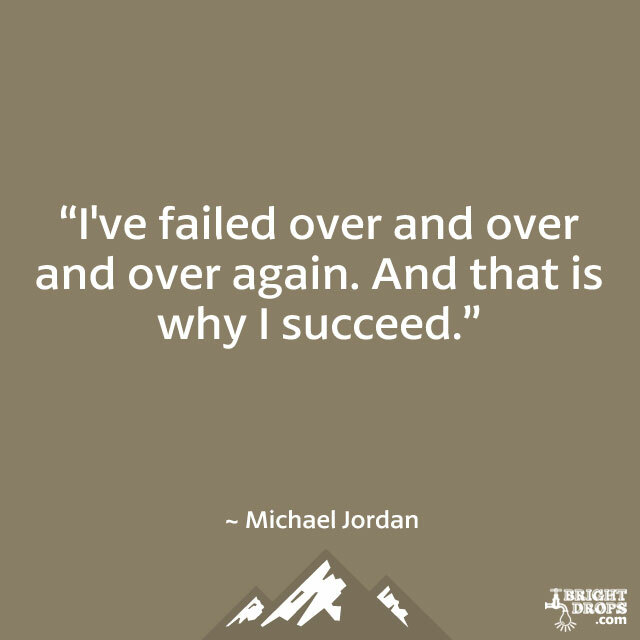 So many people try to make it so they don’t fail, so much so that they never succeed. But every great success has surely been more sweet thanks to the difficulties overcome on the road there. Would success even exist if there were no opposite? If you can learn to control your fear, to work through it, to get what you want in spite of it, you’ll be able to get everything you’ve ever wanted. Fear is not something you can just stamp out and be rid of for the rest of your life. But it is something that you can master, and it’s something that needs to be dealt with each day, as it rises up and tries to keep your dreams at arm’s length. Make fear your underling rather than having it control you and what you do each day. Focusing on what you can do and finding others to help you with the things you can’t do is the key to a successful life. Why bang your head against the wall when you come upon something that you’re not able to do? It’s not possible to be a master in every area, so be sure to put the best person for the job on each job, and be humble enough to say that you’re not always that person. Some of the most successful people of all time had great teams that were able to accomplish more than just one person could. 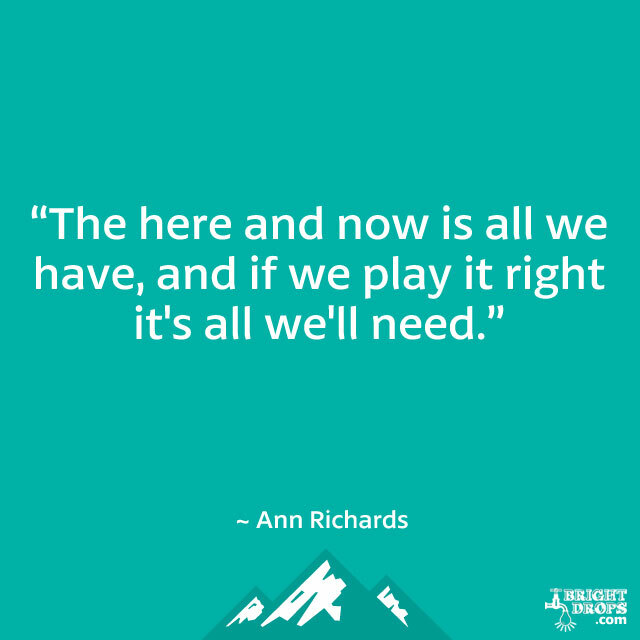 This is the perfect quote to get over the idea that you don’t have what’s needed in order to succeed. It’s easy to think that this isn’t the right place, or the right time, or that you don’t have the right resources in order to become a success. You just have to get started right now from where you are now with what you have now and your resources will grow as you go along. 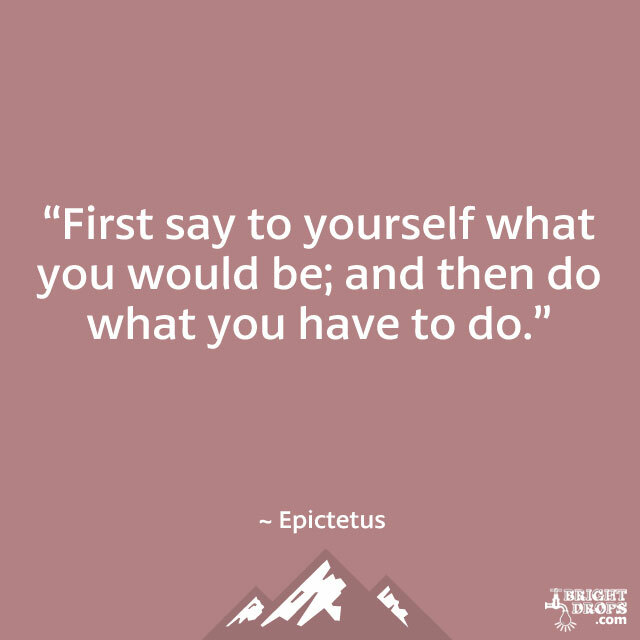 So don’t waste another minute thinking you can’t get started on what you really want to do. Who says every battle you win is over? Here’s a reminder that there are some battles you’ve have to win again and again before they’re truly finished. There are others that you may have to wage every day forever because they are never actually over. Get rid of the notion that when you’re done with a battle you’re done fighting. Bring the fighting spirit every day and battle back the forces that would otherwise keep you small. Get busy working on your own things or you’ll find yourself employed by someone else that is busy making their dreams come true. 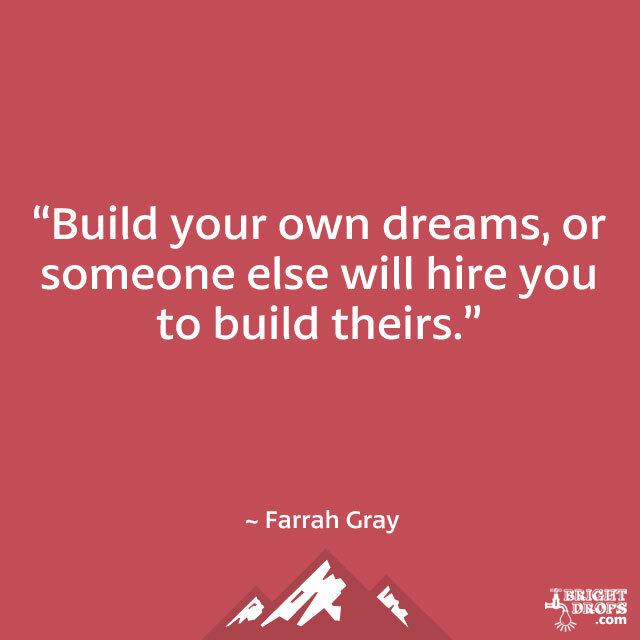 If you’ve always wanted to be your own boss and live according to your own terms, you have to start today to build those dreams up and make them a reality. Be careful you don’t find yourself spending year after year furthering someone else’s dream life while your dreams go unfulfilled. It’s an easy trap to find yourself in, and not so easy to get out of once you’re in it. Are you holding onto the things that you think identify you, and is it keeping you from being something more than what you are right now? This is an interesting quote that is saying that sometimes the labels we give ourselves keep us at a certain level, or keep us living a life that isn’t as amazing as it might be. When you let go of that you may realize that there’s more you can be, do, and have, and that it’s more in line with the person you really are. Each day is a microcosm of a lifetime, and if you treat it that way you’ll end up with a life filled with no regrets. Waste enough days and you’ll surely come to a point where you regret all of that lost time. So start your day with the idea that you’re not going to let excuses get in your way, and you’re going to stop explaining why things aren’t going the way you want. 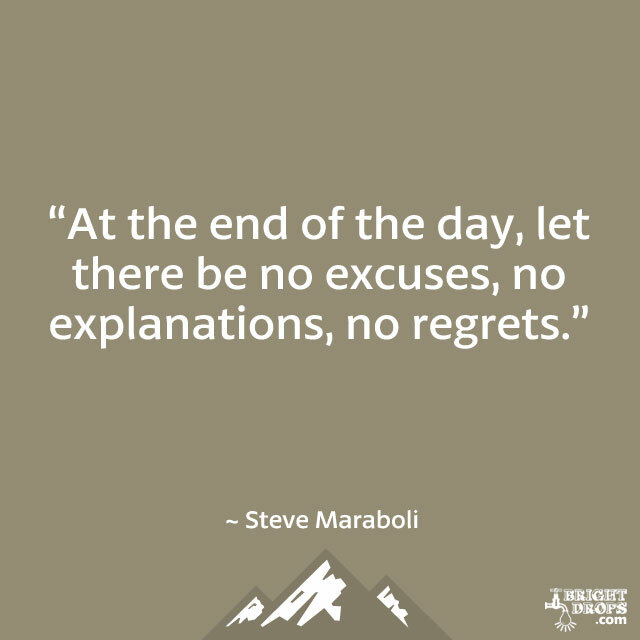 Once you banish excuses and explanations you’ll find that the things you really love will have a chance to flourish, at which point there are no regrets. Albert Einstein is right on, and all you have to do is look at how children learn new skills. You don’t automatically ride a bike perfectly, or even tie your shoes the right way without getting it wrong a few times. Instead of trying not to make a mistake in life, get out there and try new things and know that you’ll probably make mistakes as you do so. This is not the end of the world but rather a sign that you’re getting closer to getting good at a new skill. The more skills you develop, the richer the life you’ll have. This is a great way to look into the future and pull your current self towards what you want to be. What most people do instead is look at the past and beat themselves up over all of the things they’ve done. That just keeps you stuck in the past, or rather stuck in the moment because you’re not using the present to make for a brighter future. By using this future focused vision, and then starting today to do the things necessary to get you where you’re going, you’ll get there much more quickly. A funny thing happens when you do more than the rest of the pack is willing to do. The herd thins. 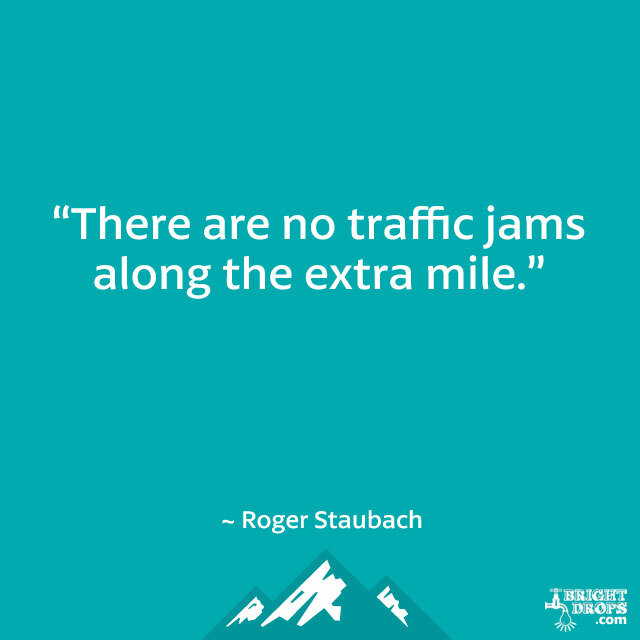 You’ll find yourself roaming free with others that are also going the extra mile. You’ll be in good company and you won’t have to worry that everyone else will get in your way because there aren’t enough people going that extra mile and making things happen in their lives. It’s sad but true and it will likely always be this way, but you can make up your mind starting today that you want to be one of those that gives more than the rest. Just because you’re a dreamer doesn’t mean you’ll be a success. But the fact is that there are no successful people that didn’t start with a dream. So basically it’s in your best interest to dream, because you just can’t succeed without doing so. 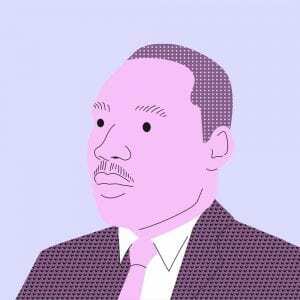 If you dream you have a chance of attaining that dream, but if you don’t dream there’s just no chance of ever reaching it because it doesn’t exist. The risk lies not in dreaming, but in not dreaming. Dream, and maybe you might reach that dream. It’s a far better idea than playing the lottery, but you have to play to win. 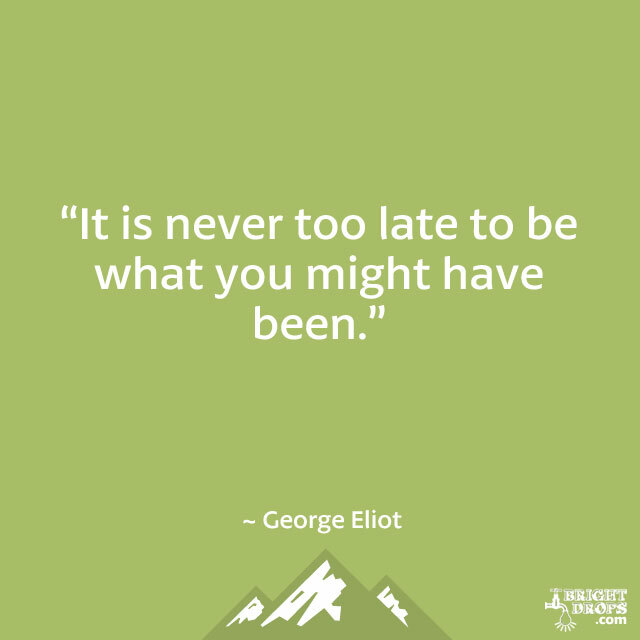 If you’ve been stuck thinking that your ship has sailed on what you could have been, stop and tell yourself that it’s never too late. As long as you’re alive and reading this and getting motivated to be all that you can you still have time. It’s like when Scrooge realizes that it’s Christmas Day and he hasn’t missed his chance to be the person he wants to be. You still have time, so get started right away on something that is in line with your vision of your true self. Falling in the trap of waiting for times to change before you do is something that can waste years from your life. Conditions will never align perfectly, and they shouldn’t have a bearing on what you do and how you live your life. You are not a victim of the circumstances around you, unless you allow yourself to be. You can feel good and go for what you want no matter what the situation is surrounding you. The funny thing is that if you change for the better you’ll find your surroundings following suit. Oprah must have believed that she could be a billion dollar media mogul long before she ever become one. That’s the power of belief, it can change the facts around to suit your vision, and can overcome all odds. It doesn’t matter what things look like on paper, or what everyone around you is saying. As long as your belief is pure and powerful that noise just doesn’t matter. But if you let those doubts seep in you’ll find that your dream never materializes. The past is only in your head, and the future isn’t here yet, so there’s only one moment that truly matters, and that’s the present moment. No matter what time it is it’s always now, and you have to do the best you can with your now moment because you’ll never get anything else. She’s saying that if you do the best in the now it’s all you’ll ever need because everything else will work itself out. Breath in. Breath out. Go make magic! If you’re looking for Easy Street you may never find it because you have to work to get there. It may seem like the Holy Grail of success but it would be pretty boring to just have everything be easy and then stay easy for all the rest of your days. Working hard gets you to where you want to be, and once you get there don’t be surprised if you want to keep working. It keeps your mind active and makes you feel good so don’t shy away from good old fashioned hard work when it comes to reaching your goals. Thanks for sharing this. Much appreciated. I love a lot he quotes here I use them with my teams as a coach it is frustrating seeing how kids with so much talent don’t have the same amount of self confidance and I hope that one day they can actually look at the quote of the day and belive in themselves as well. I have been sharing this quotes with my teams on regular basis (Morning Dose), Kindly update fresh quotes. Beautiful, found this @ a point in my life where I’m trying to change who I’ve been & everyone around me wants me to remain the same. I so needed these words of encouragement & wisdom. Thank you so much for sharing. People say to you, ‘you’ve change. Well I don’t want to be the same person all my life. I want to be growing, I want to be expanding. I want to be changing. Because animate things change, inanimate things don’t change. Dead things don’t change. And the heart should be alive, it should be changing, it should be moving, it should be growing, its knowledge should be expanding. Wonderful work.Thanks for sharing this quotes and words.I beleive they will make me the person i am meant to be. Great quotes. Reading them made me remember the last day of my work. I was let go unexpectedly and one of my friends at work was worried for me. I don’t know where this came from but I told her this “I never lose, i either win or I learn”. I’m going through radiation & chemo at the moment. I’ve searched other sites for something uplifting. Just was not for me….I am very happy to come up on your site. 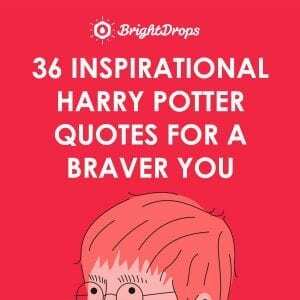 The uplifting quotes are “Priceless”! They have really helped me!! Keep-up the great job!! VERY SPECIAL! !